← Alvit Sharvit …Reflections and deep emotions emerging on canvas. 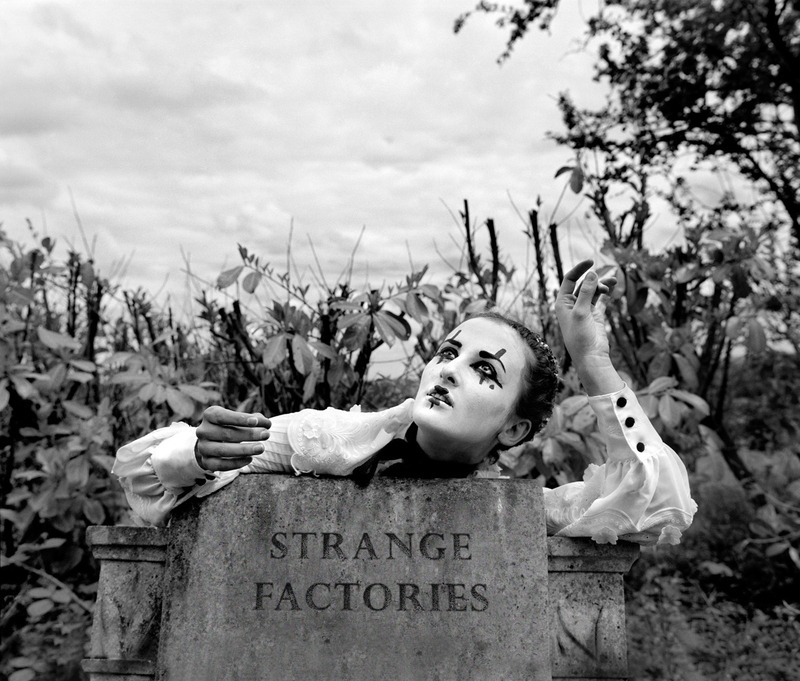 ‘Strange Factories’ is an independent feature film that tells the story of a writer trying to unfold the mystery of a fable in a world haunted by a phantasmagoric fiction. My work as writer and director on ‘Strange Factories’ has afforded me the time to reflect on what it is to be a storyteller. In turn I’ve felt a deep connection grow within to the history of storytelling and the storytellers who left us long ago, but perhaps still exist in the narratives that will always be part of us. Their blood still courses through the stories that communicate the mystery at the heart of all our lives. Street lights cast shadows across the entrance to a theatre. The word EMETH is presented on an illuminated sign. Humans literally told themselves into existence. We are constructed from a million narratives that have accompanied us across time, exhaled and etched on every conceivable surface, so that even in the darkest times we would never forget who we are. What we call reality and every element in it is constructed from stories and myth. The surface of fiction is present everywhere. What is physics if not a beautiful story, told in an intricate language of symbols and meaning that we’re still very much engaged in the act of telling, as we travel far deeper to the heart of its truth. Every interaction and reaction in our lives are nodes of a story. Some stories we are part of, others we’re mere walk on characters, passing across the field of vision on the narrative plane of view. We understand the nature of good and evil through the stories we are told as children and we mix these perspectives to become part of us as we age and travel through our lives. Sometimes we play the villain in another’s tale, the antagonist who comes to destroy. In other moments we are victims, martyrs or even a saviour and just once in a while we are the eternal hero. Reincarnated through mythic tales time and time again, a memory of something so powerful it will never fail the true memory of what we are. The Sun burns bright in the sky above a clearing in a forest. A crowd of people stand at the edge of the tree line, staring into the darkness that the trees hide. For good and for bad, stories have changed my life, altering my perceptions of self, time, reality and fiction. The stories that I have channelled as a writer have connected me to the world in a way that forces me to see the bright and hidden truths in the undercurrents of the fiction that ebb and flow all around us. The best storytellers lose themselves inside their stories. Some go insane at the sight of their own lives reflected back in the challenges their characters face and in turn come to learn how they too are a character in a grand tale that stretches beyond the confines of our lives and understanding. Through the eye holes of a mask we see the white pages are bright and give off luminosity. The worse time I ever endured in life, was a period of six years in my own story, where it felt like I was playing a character who held no truth, forced to exist in a formulaic story I had never intended to create. If my life had been a book during those years, I would have closed the cover and stopped reading. Life has but one purpose: To tell the story of who we are honestly and to best of our ability, no matter the cost. It takes time and effort to perfect the beats of your own narrative and to become who you were born to be. We must never cut out the most wonderful and powerful narrative arcs, the sections where we are forced to face the challenges on the road less travelled, to find ourselves lost in the darkness of the woods, for this is where we learn who and why we are. When we endure and resurface. To reach the truth we must endure the most complex aspects from the tales that complete us. It’s a privilege to be a storyteller, there is no higher honour than to be engaged in creating ‘Strange Factories’ for you. I hope it will be a story that you will experience and perhaps one day in the future, it will come to haunt you. The silhouette of a large house. A light comes on in a upstairs window. The silhouette of a young woman. She raises her hand and waves, beckoning for the person watching to come towards the house. The Awakening Arts network would like to thank John Harrigan for being a guest contributor and Yiannis Katsaris for his kind permission to use the photographs. Please support the Strange Factories project by visiting www.indiegogo.com/strange-factories and donating so that the project becomes fully alive. The websites for the project follow. If you believe in our film, then please do let as many people as you can know about it! You can use the buttons above to post our IndieGoGo page to your Facebook or Twitter. Or, if you prefer please email friends, family or anyone else you think might be interested. Anything you feel that you can do to help spread the word. John Harrigan and Foolish People are grateful for your support and they really do want you to be part of this project. They hope that one day soon they’ll pass by you in the village on your way to the Festival of Memories or maybe even see you following the sound of the hum, searching for the location of Stronheim’s ‘Strange Factories’. This entry was posted in Arts, Collaboration, creativity, imagination, Inspirational artworks, Storytelling, Thoughts and writings and tagged Art, Creativity, Foolish People, John Harrigan, Performance, storytelling, Strange Factories, Yiannis Katsaris. Bookmark the permalink.